You can’t miss all the nails in the road. Getting a flat tire is no fun whatsoever. That’s why you’re covered! 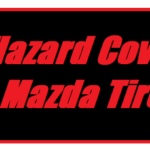 Keep reading to learn more about Mazda’s Road Hazard Coverage.